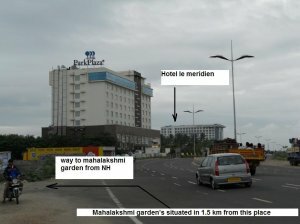 SRI MAHALAKSHMI GARDEN located @ Coimbatore to Avinashi NH Road. Exact Location; 2.5 km from chinniyampalayam bus stop. Landmark : just behind lemeridian hotel. •30 feet exiting road from coimbatore-avinashi NH.